In the late 19th and early 20th centuries, African-American poetry and fiction began to develop in two distinctly different ways. 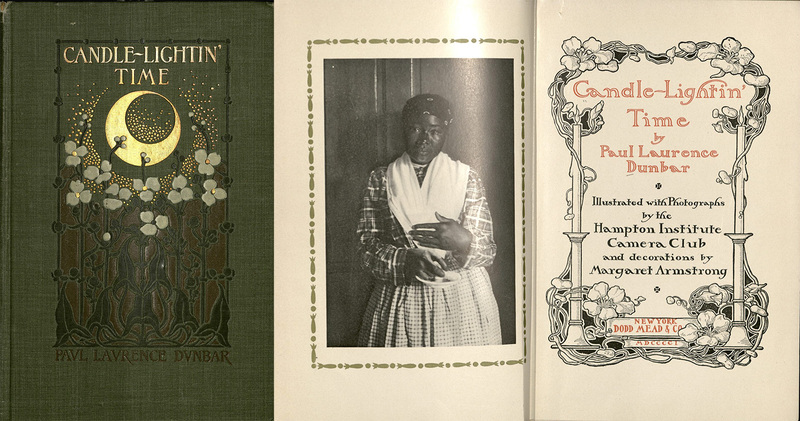 As educational opportunities improved in selected areas of the United States, some black writers sought to emulate the traditional forms and themes of classical white authors. Still others began to experiment with non-traditional styles, seizing upon opportunities to battle racism through literature. Paul Laurence Dunbar (1872-1906) was one of the first professional African-American writers. 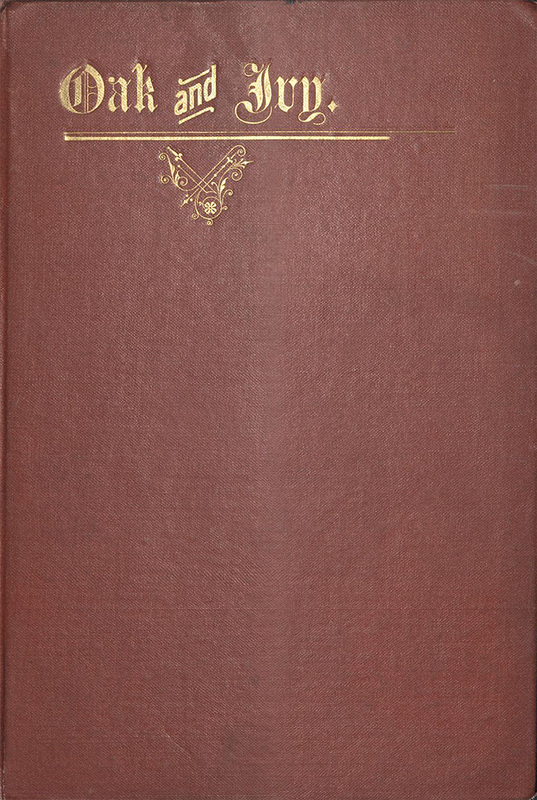 In 1893, Dunbar published his first volume of poetry, Oak and Ivy, which experimented with both traditional verse and African American vernacular. Dunbar went on to write more than a dozen books of poetry, including Candle-Lightin’ Time and In Old Plantation Days, as well as four books of short stories, five novels, and a musical comedy. Dunbar’s work appeared in many mainstream publications, including Century, Lipincott’s Monthly, the Atlantic Monthly, and the Saturday Evening Post. Sutton E. Griggs (1872-1933) produced more than thirty books and pamphlets over his lifetime, making him one of the most prolific African-American writers of the early twentieth century. His first novel, Imperium in Imperio (1899), which went largely unnoticed until the 1960s, portrays a future in which a separate African-American state exists within the United States. Griggs’ later works dealt with many of the issues faced by African Americans at the turn of the century, and included themes such as economic and political repression, barriers to education, the abuse of women, mob violence, and lynchings. Griggs’ novel, The Hindered Hand: Or The Reign of the Repressionist (1905) is believed to be in direct response to the racist writings of Thomas Dixon and Thomas Nelson Page, whose publications glorified the antebellum American South and white supremacy. Countee Cullen (1903-1946) entered New York University in 1923, where he studied literature and became heavily influenced by Keats, Shelley, and other traditional poets. While attending NYU, he placed second in the prestigious Witter Bittner Poetry Contest for The Ballad of the Brown Girl, a retelling of an English folk ballad. 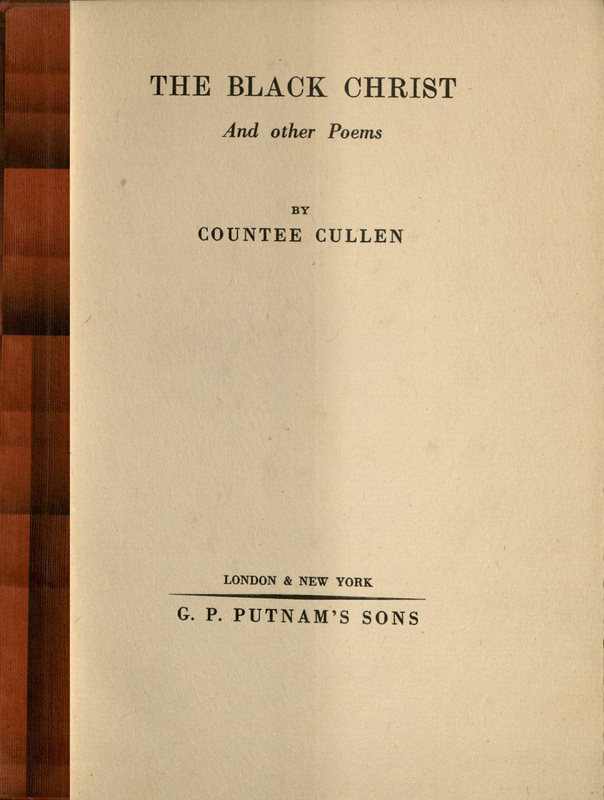 Cullen entered Harvard University in 1925, and in the same year published Color, his first collection of poems. 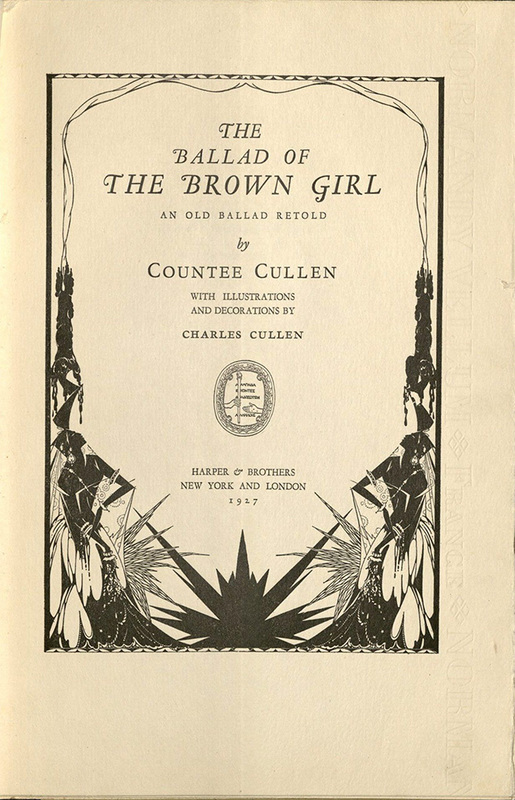 Interestingly, several leading writers of the Harlem Renaissance, including Langston Hughes, criticised Cullen’s work for its classical form. At the time of its publication in 1929, Cullen’s The Black Christ and Other Poems was also widely criticized for its religious imagery, which drew parallels between the crucifixion of Christ and rampant violence against African Americans throughout the 1920s. Gwendolyn Brooks (1917-2000) published her first poem, "Eventide" at the age of thirteen in American Childhood magazine. By her late teens, she had become an adjunct staff member of the Chicago Defender and published nearly one hundred poems in a weekly poetry column. Brooks' first book of poetry, A Street in Bronzeville (1945) received critical acclaim and brought her work to the forefront of American literature. She received the Pulitzer Prize for Poetry in 1950, the first African American to win the prestigious award. Brooks' early work employed traditional poetic forms to capture the day-to-day lives of urban African Americans. In the late 1960s, she became involved in the Black Arts Movement, experimenting with less traditional forms, and turning a critical eye toward issues of patriarchy, prejudice, and class inequities. 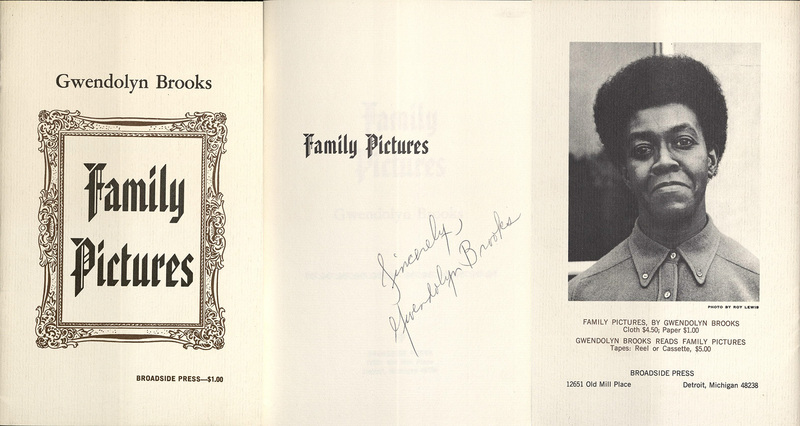 Family Pictures (1970) demonstrates the beginning of an evolution in Brooks’ work, in which she utilized free verse with a focus on civil rights, black nationalism, and the black communal experience.